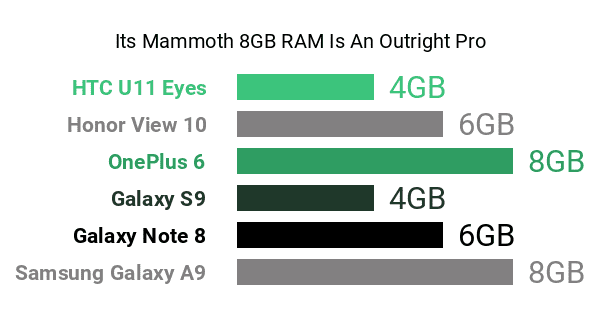 Flexing some premiums-class muscles on the imaging front (probably enough to plug it into Phonerated's list of the best smartphones for imaging) is the Samsung Galaxy A9, one of the world's first quad-camera smartphones . Its rear camera is composed of four distinct lenses -- a high-resolution 24-megapixel lens for standard photography, a 5-megapixel depth-sending lens that enables hardware-level bokeh filters, a 10-megapixel telephoto lens packing a 2x optical zooming capability, and an 8-megapixel wide-angle lens for scenic shots of up to 120 degrees. Weirdly, however, its list of specs do not include optical image stabilization , although flagship-class imaging pros, such as 4K-2160p video-recording and a high-CRI LED flash are readily on board. Another slight stain on its assortment of pros and cons is the fact that its 6.3-inch Super AMOLED display settles for an FHD+ (2220 x 1080) resolution only , reaching a pixel density count of no more than 393ppi as a result. In comparison, a few of its rivals in the high-end phablet department rock QHD/QHD+ (1440p) screens and score more or less 500ppi. Perched right above its forenamed display is a highly-competitive 24-megapixel selfie camera that carries the phone's AR Emoji feature and facial recognition system. Sadly, Samsung did not bother decorating its front cam with upmarket features like a full-blown front-firing LED light or standard autofocus. Nevertheless, its raw pixel resolution made it worthy of comparisons against some of the best selfie-first smartphones available at the time of this technical review. Looking into its under-the-hood components, although its octa-core engine's 2.2GHz top speed comes off as a slight con, knowing that alternatives running on 2.5GHz chips are not that hard to find, the fact that it boasts a massive 8GB RAM (A 6GB-only version is offered as well) easily makes up for that setback -- get to know other 8GB-RAM phones here. Its 128GB internal memory, which can be expanded by up to 512GB , sounds reassuring as well, although we expected a bit more than 3800mAh of raw power on the stamina front, considering its auspicious cameras and large display. When it's all said and done, the Galaxy A9's pros and cons make it a solid choice for tech junkies eyeing a high-caliber photography-driven flagship.